How do you convert a dated 45-year-old library into a modern learning commons that will serve the purposes of students and faculty well into the 21st Century? In October 2017, Springfield College dedicated their new state-of-the-art Harold C. Smith Learning Commons. Springfield College is a private college located in Springfield, Massachusetts and is known for its association with the YMCA and as the birthplace of basketball. 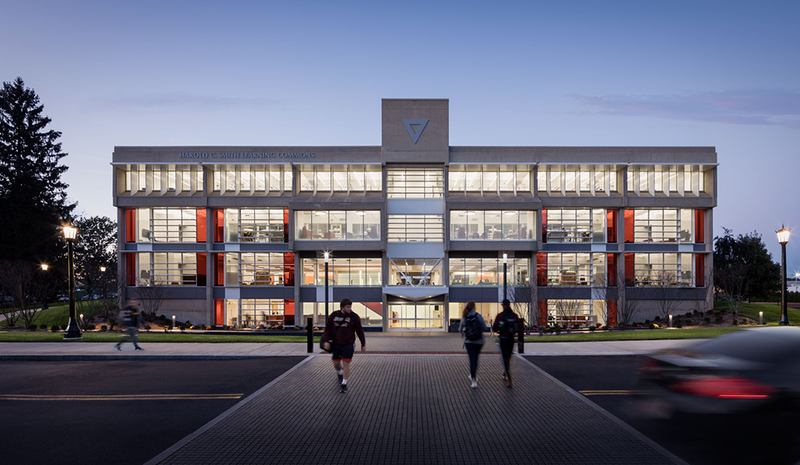 The Learning Commons was named in honor of Harold C. Smith, a member of the Springfield College Board of Trustees for 31 years who enjoyed a long career with the YMCA Retirement Fund, eventually rising to become its President & CEO and Chief Investment Officer. What are the Features of the New Learning Commons? Formerly known as Babson Library, and originally devoted to physical stacks of books and journals, the new Harold C. Smith Learning Commons incorporates updated functions to create and reinforce learning environments that students need to prosper in the 21st century. The original 4-story, 57,000 SF concrete and brick building was built in 1971 in the Brutalist-style, and had very little natural indoor lighting and numerous building challenges. What Services Did Vantage Provide? The key to transforming an existing library building into a modern Learning Commons required turning the building inside out and understanding the needs and expectations of 21st Century students. Well beyond a typical building “programming phase”, Vantage and Icon Architects engaged with the campus and library stakeholders to understand the future vision for their own mission, and to find new opportunities for them to combine functions and building uses, and define resources. This phase identified their unique needs and helped them vision the possibilities of how technology could meet those needs. The key to this successful project was that we embedded the technology discussions early and as part of the architectural design process. This enabled us to understand how people work and innovate together to create a flexible vision and build consensus for the exciting ways technology that could be leveraged in the new learning commons. Our extensive planning work, which re-energized the campus innovation curve and strategic plan, led to an advanced pre-construction project report that defined all campus use-cases for technology in the library and answered them with information transport and security systems within the new building. The final report also included suggested technologies to support those requirements and cost estimates for all audiovisual systems throughout the Learning Commons’ for the lobby, conference rooms, conference center, The Forum, group study rooms and classrooms. Another key contribution was in the security and access controls of the new facility. As parts of the Learning Commons will be open 24 hours per day, we helped Springfield design IP-enabled door security protocols for programmable after-hours restrictions. In addition, we provided design support on IT and security systems including schematic documents, design documents and construction documents for all low-voltage infrastructure including audiovisual, security, digital media, wireless network, video conferencing and distributed antenna system (DAS). We also managed bidding and construction administration of the AV systems. What are the Strategies Are Driving Vantage’s Transformative Approach to Technology? Technology has become the foundation of academic support and learning in the 21st Century. Most buildings are built to last 30 to 50 years or are renovated on a 20 to 40-year cycle, but technology systems encounter major shifts about every 7 years. Even if technology didn’t change, use cases evolve over time. In 1970, the College could not have envisioned the drastic changes in how a library is used and how students apply new technologies in their learning. We build flexibility and resilience into the facility that will endure for decades by adding user accessible cabling and mounting points to facilitate adaptation, using more paradigm-proof cabling such as fiber-optics that may not need to be completely replaced in the future, providing more capacity than currently needed and identifying clear upgrade paths for key technologies. New and novel is a fleeting pursuit and Vantage does not specify technology for technology’s sake. We worked with the entire project team at Springfield to create a clear vision of what they wanted to achieve, and what would be useful and would best serve the unique identity of the college. We are deeply engaged in what is happening with technology and in the higher education space. We serve on governing bodies to establish new standards and work with manufacturers to research and design solutions that will meet our clients’ needs. As such, we see beyond today’s trends to a decade or more of changes in the future and help our clients navigate through the unknown to realize an optimal and enduring solution. Vantage has worked in every aspect of educational technologies and are constantly exploring opportunities for innovation. Our work in higher education includes strategic planning processes that address shifts in financial and operational goals, technology master plans that will provide a foundation for future growth, and evolving building technologies that include simulation suites, flexible classroom space, distance learning and the reinvention of libraries. Acknowledgements: Images in this post are courtesy of ICON Architects. Pictures of the complete renovation are available on Springfield’s Flickr account. The YouTube video of the Learning Commons Dedication was produced and shared by Springfield College.